The problem with cleaning out the freezer, pantry, and fridge, is that you generally have to make additional purchases to put together any sort of coherent dinner. The real trick is in trying to use up 100% of your purchases when you make them so you aren't just adding to the inventory in those three locations. Tonight was one of those nights. Jen decided that chili would be a good idea. With another snow storm set to start any minute I went to the corner store to purchase a few items so we could get started. 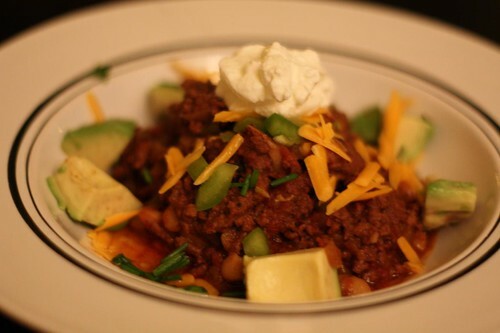 I have not always been a huge fan of chili. In fact, I have an instinctive negative feeling when I even think of chili or even hear the word spoken. I think it's because my earliest memory of chili is that scene from Mr. Mom where Michael Keaton feeds his baby chili with predictable results. So I have long associated the dish with a baby's gastrointestinal distress which can ruin you on a food quite early in life, perhaps before you've ever eaten it. However, much time has passed since seeing Mr. Mom and I am able to have the dish on occasion after I shake off the initial feeling. Jen brewed some coffee and soaked rehydrated some dried chilies while I cooked up some garlic and red onion with bay leaf, cinnamon, cumin, smoked paprika, and oregano. Then I cooked down some ground beef from the freezer, added a can of diced tomatoes, chopped green pepper, some of the coffee, and the cannelini beans and let it simmer for about thirty minutes. It was quite good but like all dishes of this nature will probably be better tomorrow than it was today. A while back Jen made this buttermilk bread after we'd had at Grace restaurant in Portland, Maine. It's been in the freezer for a short while so I sliced it up, buttered it, and griddled it in a pan. This was a technique I learned from a place near where I grew up in Rhode Island that used to offer the option of grilling a muffin if you ordered one. It turns out that the only thing better than a muffin is a muffin cut in half, slathered in butter, and browned on a griddle. 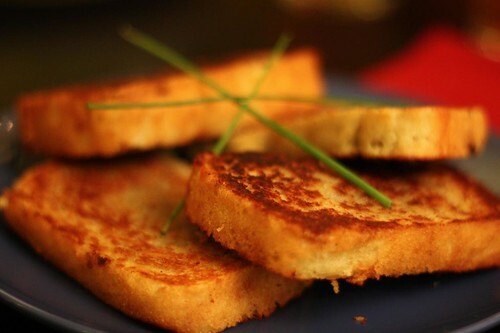 The buttermilk bread was no different, though Jen grew tired of me talking about how I'd griddled it. But I did! I did griddle it! 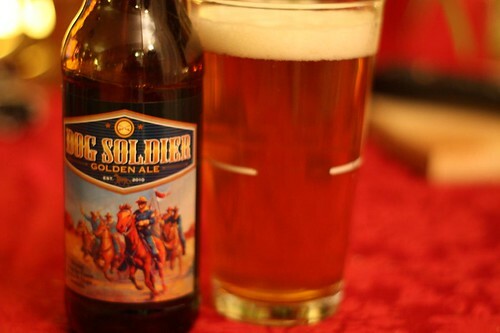 For beer I had the Dog Soldier Golden Ale from Cavalry Brewing. Apparently this particular beer is named after someone in the Iraq war who expressed his disdain for those running the war to a reporter. This is the first beer under 7.0% alcohol that I've had in a long time. I won't be expressing my disdain about that to anyone. To be able to have more than one beer is truly a treat except for the fact that I only bought this single bottle. Beer is another thing I've accumulated too much of in the fridge. There must be a dozen individual bottles of beer that I need to try and, like usual, the seasonal brews have taken over. It will be well into the spring before I'm able to catch up. Let clean up month continue!